It is widely known that samurai were keen to take the heads of their enemies as a way to prove where they were victorious. Reports on taking heads go way back to the mid Heian period but a kind of ritualized aspect of this act did not emerge until about the Genpei War which marked the end of thei Heian and the beginning of the Kamakura period. That means the more taken heads a warrior was able to present at the end of a battle, the more likely it was he was rewarded by his lord. Now I would like to introduce a more modern but still very graphic rendering of this bloody tradition. The picture shown below depicts the young Maeda Toshiie (前田利家, 1538-1599) returning victorious from the Battle of Okehazama. When Imagawa Yoshimoto (今川義元, 1519-1560) was on his way entering Kyôto in Eiroku three (永禄, 1560), he had to cross the territories of Oda Nobunaga in Owari province who of course wanted to stop him. It is said that Toshiie was not allowed by Nobunaga to participate in this battle but he nevertheless did, taking one enemy head right in the morning and two during the main battle. But Nobunaga was angry and did not allow him to come back into his service. But one year later Toshiie again decided for himself to participate in the Battle of Moribe (森部の戦い) where he took the head of Adachi Rokubei (足立六兵衛), a retainer of the Hibino family (日比野) and a tough hero nicknamed „Kubitori-Adachi“ (頸取足立, „the head-severing Adachi“). But Toshiie was also able to take another head in this battle and for these deeds he was finally rewarded by Nobunaga by an increase of his salary by 300 kan.
Well, apart from the head taking reports of Toshiie, he also got the nickname „yari no Mataza“ (槍の又左, „Mataza the Spear“) as „Matazaemon“ (又左衛門) was one of his first names. This nickname goes back according to transmission to the Battle of Ukino (浮野の戦い) which took place in the first year of Eiroku (1558) when Toshiie was 21 one years old. He was namely wielding a yari with a 6 m 30 cm long shaft in this battle and decided to make the spear his main weapon. Picture 1: Maeda Toshiie Okehazama gaisen no zu (前田利家桶狭間凱旋図) by Ganryô, ink and colours on silk. 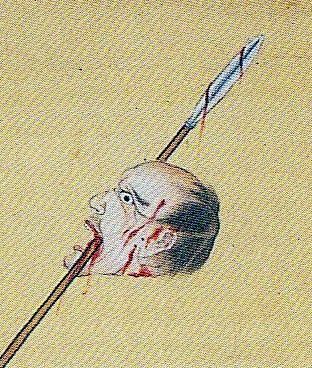 The depiction is actually an exaggeration of Toshiie´s merits as it shows four taken heads whereas the Nobunaga chronicle „Shinchô-kôki“ (信長公記) speaks „only“ of three taken heads as mentioned above. The picture came from the possessions of a later Maeda retainer and was clearly ordered for boosting the morale and fighting spirit. The artist chosen for fulfilling this task was Ganryô (岸良, 1798-1852). Ganryô was born as „Hamatani Gorô Masayoshi“ (濱谷五郎昌良) in Kyôto. His nicknames were „Shirô“ (子良) and „Saeki Ganryô“ (佐伯岸良) and he also bore the pseudonyms „Ga´un“ (画雲) and „Jôkaku“ (乗鶴). He entered an apprenticeship under master Ganku (岸駒, 1756-1749), the famous founder of the Kishi school (岸) of painting, and married his eldest daughter Tei (貞). Later he worked for the Imperial Arisugawa-no-miya family (有栖川宮) but was somehow outshined by Ganku´s son and heir Gantai (岸岱, 1782-1865). Well, Ganryô did not focus on the traditional „Kishi tiger motif“ but followed more the style of the Nanpin school (南蘋派). The latter goes back to Chinese artist Shěn Nánpín (沈南蘋, 1682-?) who worked basically in academic Ming styles. Shěn Nánpín stayed from 1731 to 1733 for two years in Japan and his paitings became very popular as the Japanese taste developed more and more towards realism in the 18th century and also because the novelty of his style and its decorative appeal. Thus also Ganryô´s paintings are more realistic and his trong points were depictions of figures and the so-called „bird-and-flower genre“ (kachô-ga, 花鳥画). 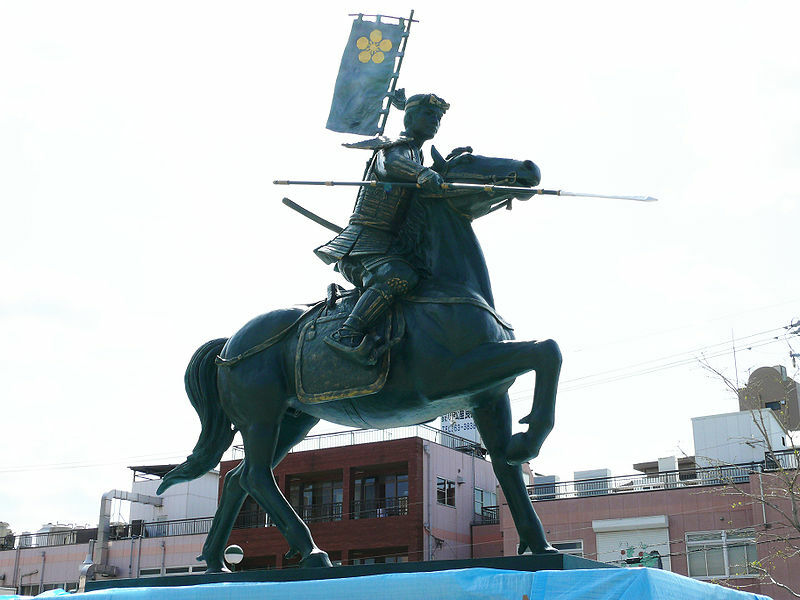 Incidentally, as Maeda Toshiie was born in the village of Arako (荒子) somewhat to the southwest of Nagoya (it is now a part Nagoya), the city commissioned the sculptor Tabata Isao (田畑功, 1955- ) in 2007 with a bronze statue of the young Toshiie riding into his first battle with his spear. You can see the statue when you take the Aonami Line from Nagoya Station and leave at Arako. It was erected right in the centre of the traffic circle in front of the station (see picture 2).